In other words, except the Public Servants, none should use any Digital Prescription or Electronic Prescription provided by any Governmental System or non-Free Service Providers (non-Free means do not obey the ruleset by Free Software Foundation) to protect own and patients’ personal Data Theft. Cloud Computing Platform, here only represents a low cost or free alternative to co-location server. Cloud Computing Platform can mean any Cloud Computing Service Model, however, usage of Private Cloud can be thought for robust security. As the Author and This Website are publishing the idea implementing an Open Standard Digital Prescription with GNU GPL 3.0 License, except without prior information to Dr. Richard M. Stallman as Third Party, none should add a Closed Source Software or Software with Dubious, Dual License. The Software representing the practical usage of the rulesets. For practical usage, compatibility with existing command line tools is more important than developing a GUI based program as a Prototype application maintaining the Standard. As US Government has practically failed to provide any true security (recalling Rofecoxib and Human Deaths), Free Software, Gratis or for Fee, should itself override any fair intention. There is, at least one, so called certified, cloud-based e-prescription platform available from Haymarket Media Group, a privately owned media company headquartered in London, United Kingdom. Our proposed solution has no relationship with the said model. Taking the conventional definition of prescription (â„ž), which describes a prescription to be a health-care program implemented by a physician or other qualified practitioner in the form of instructions that govern the plan of care for an individual patient. Here the word Program was used to mean “A set of structured activities” not a Software Program. Corresponding Software Should Have a Command Line Interface and Hitting W should reveal the GNU GPL 3.0 License. The key W is taken as an example on GNU GPL 3.0 License. 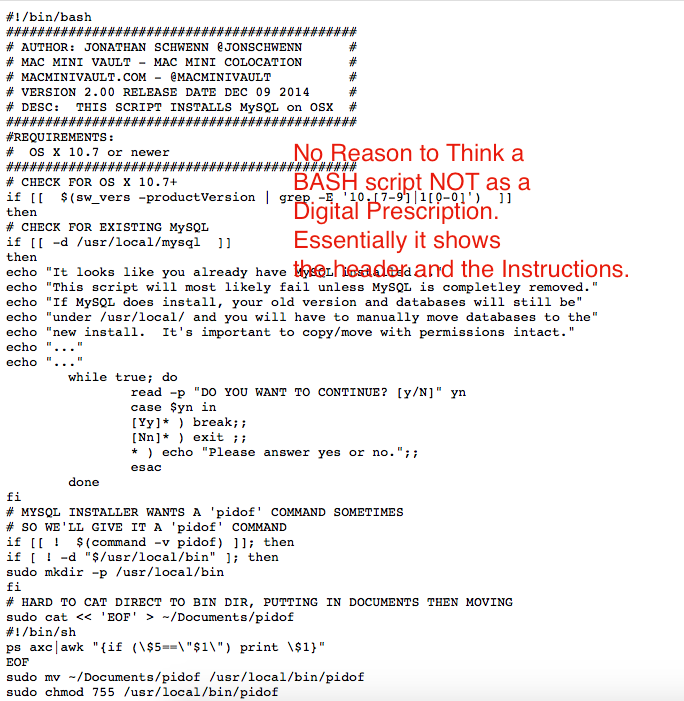 Ideally the document should bear no extension but readable with any Text Editor including GNU Nano, Vi from command line. MySQL so far, is the most commonly used Database software to ordinary individual. It can be used for saving data. MongoDB is better alternative and has practically usable extensions extending the RESTful API. The document should allow to use normal cURL, wget etc. basic tools. Upon running the standard curl -I <location>command against the document, while publicly being accessible (publicly means within a network NOT over the Public INTERNET) should return proper headers. The document and Software should be compatible to all the Free Softwares which use GNU GPL 3.0 License to embed any document which has an existing or future IEEE Standard – this is important for including the 3D medical files. If revision or versioning is used, it should be usable with any currently used versioning software which use GNU GPL 3.0 License. Revisions must be available with time stamp. Everyone has a terminal since the past 4 decades, so this Standard of Digital Prescription should not create any compatibility issue. The description actually defines a typical robust Text Editor where the output is universally readable, user can add own method of naming the files. Hard copy, ideally should print the text on any standard printer with own real life prescription – that is the Hard Copy. Printing, in essence, will not print the header and footer – which is included on own real life prescription with proper security to prevent forgery. This Article Has Been Shared 356 Times! Most users feel difficulty to setup FTP/SFTP client like FileZilla to transfer files on HP Helion Public Cloud. Here is guide on HP Cloud FTP. Cite this article as: Abhishek Ghosh, "Digital Prescription : Standard for Cloud Computing Platform," in The Customize Windows, December 21, 2014, April 23, 2019, https://thecustomizewindows.com/2014/12/digital-prescription-standard-cloud-computing-platform/.